The “Quellensuche” currently comprises round about 180 different archives. So you can see that it is very difficult to get an overview about all the different archives. Free and fee-based providers, such as FamilySearch.org, Ancestry.com, or Archion.de also expand their offerings permanently. On the one hand, this is a very pleasing situation, but represents a very difficult situation for the interested family researcher, because there is a lack of a central overall view of the available sources, their repositories, and online resources in our research areas in Pomerania. But what is the “Quellensuche,” and how can it help in our research? The starting point for the researcher is the integrated location search. So the user starts searching for a place where the ancestors lived or came from. After selecting a search result, you will be taken to an overview page, where you can find first information about the place on top of the overview page. The geographical location of the place is showed on a map and the affiliated registry office and parish are listed. For the institutions all sources for family research (civil registry documents/ church books) are clearly listed in different categories. They contain information on time spans, storage locations and links to online available digitized data. In addition, any existing “Find Aids” will be displayed. These are for example directories of contents, name registers and transcripts of sources. Additionally, there are some more possibilities in the “Quellensuche” to get an overview about sources for family research. These functions allow you to view all or all online church records or registry office documents for the different Pomeranian counties. The “Ortsverzeichnis” (Place-Index) show all places of a county in alphabetical order. After selecting a place from the list, the user will be referred to the place overview page described before. So far, the stock data from 180 different offices and archives have been collected. There are currently information of about 750 different civil registry offices and about 1100 parishes or affiliated churches. Certainly there are still gaps, especially in the Western Pomerania church book collections. 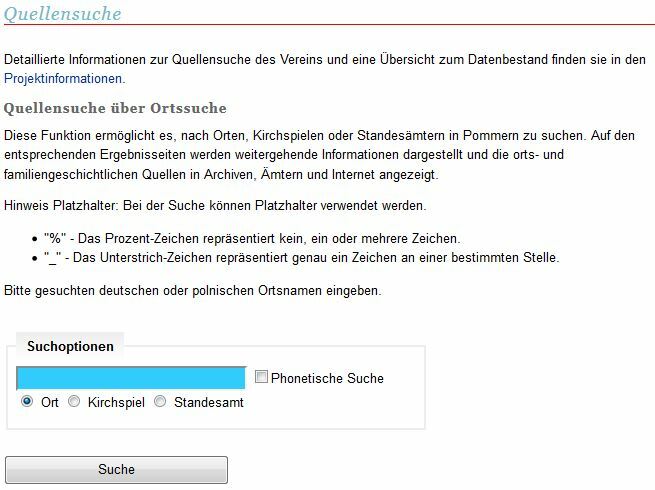 Therefore, we look forward to receiving reports about missing or incorrect sources via the email address quellen@pommerscher-greif.de. We need your support to complete this project and help all family researchers with it. Of course we are also grateful about comments and suggestions for improvement. Readers who are unfamiliar with the German language can use the automatic Google translation on the left menu on the page to translate it to English. A nice example with extensive sources in various archives and digitized source of several providers, is the page of Zarben, Kreis Greifenberg. This article was written by the contact person for the Pommerscher Greif’s associated databases. Danilo is also the contact person for the Franzburg-Barth research area. His long-term project is the BÜNNING/ BÜNTING families in Vorpommern.